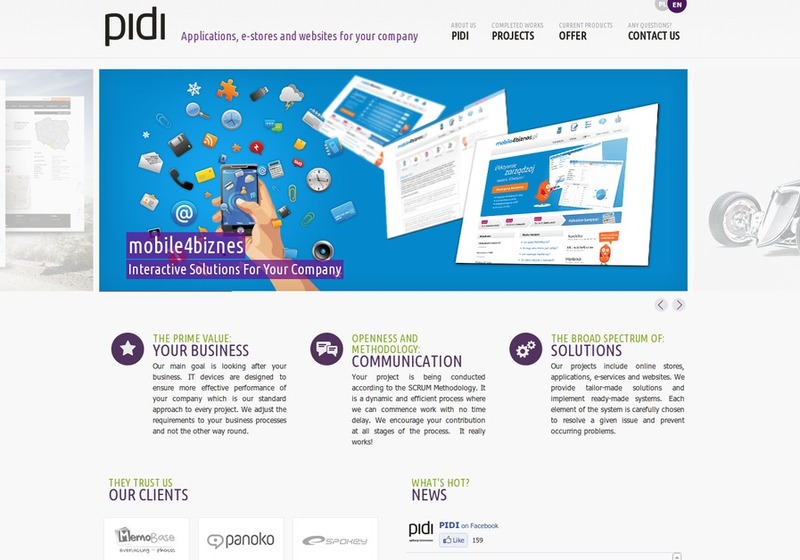 PIDI is a company which specializes in creating online applications. This short sentence, though true, doesn’t fully describe our approach to what we do. For us, Internet is a tool that enables companies to improve their activity in every way. Our main goal is to help your company’s operation thorough introducing IT systems, creating new IT solutions, launching new products and services, thanks to which your life will become easier. We are eager to extend our services way over the boundaries of sole IT support. For our clients, we are a partner who, not only will fulfill the task assigned, but also will engage in creative problem solving, both in the fields of IT and business processes. Thanks to this approach we built long-term relations of mutual benefit. In our projects we recognize business values to be superior to the technology. Even though, we are engineers we don’t let our fascination with new technologies to veil common sense and understanding of our clients’ business values. We consider your needs and potential to suggest the best route for your ideas’ development. We understand that your business is flexible and that needs can sometimes change during the course of the project, we are open and quick to modify the plan in such a way to reach our goal: the success of your business. E-commerce is a challenge, which can be successfully approached with the aid of effective IT solutions. We are implementing Open Source stores and paid solutions. Existing stores are the basis for us – your business deserves more, that is why we adjust and upgrade your software. Each product and each company is unique, which, at the earliest stage of planning and implementation, obliges us to get full insight into your business’ activity and directions of its development. Having this knowledge, we can advise you on the form of the sales system, both for your customers, and the employees managing the device. We cater you with the tailor-made solution that will help you to gain the advantage over your competitors and increase your sales. You are often wondering how to optimize various processes in your company? Maybe you and your employees waste too much time on repetitive activities or some problems arise due to the lack of communication and poor management. You feel that your business has stuck in ineffective routine? In that case, the solution for you is effective informatization. We will analyze your business activity and present you with a solution, that will let you focus on the crucial matters, leaving prosaic nuisance to the technology. Thanks to your own application you will make room for your employees’ creativity and potential, at the same time, gaining control over your business. Start-ups mean tempting freedom, revolutionary services, new business models. They are undertakings based on innovation, risk and dynamic development. Not to worry if, while establishing new enterprise, you stumble upon some IT problems. You can trust our experience and professional approach, which will prove useful in case of resolving technology meanders and traps. You can focus on gaining new clients and implementing your ideas. We offer partnership for investors in execution of a given investment. We propose the highest level of service and emphasis on cost-effectiveness of the enterprise.